A crispy tortilla, topped with refried beans, ground beef, another tortilla, salsa roja, melted cheese and served with guacamole, sour cream and jalapeño slices. Tortilla chips covered with sauce, cheese, beans and beef or chicken topped with guacamole and sour cream. Jumbo shrimp in a traditional mexican cocktail sauce. Fresh shrimp with diced tomatoes, onions, cilantro, jalapeños, mixed together with lemon juice. Jack cheese fondue topped with chorizo and served with warm tortillas. Marinated chunks of broiled chicken breast on a bed of tossed lettuce with our very own creamy Caesar's dressing. Served on a crispy flour tortilla shell. Crisp blends of lettuce topped with avocados, tomatoes and cheese. Served in a crispy flour tortilla shell. a flour tortilla shell filled with refried, charro or black beans, shredded beef or chicken, lettuce and cheese. Topped with guacamole and sour cream. Grilled salmonon a bed of mixed greens. Tossed with our pepita sauce queso freso. 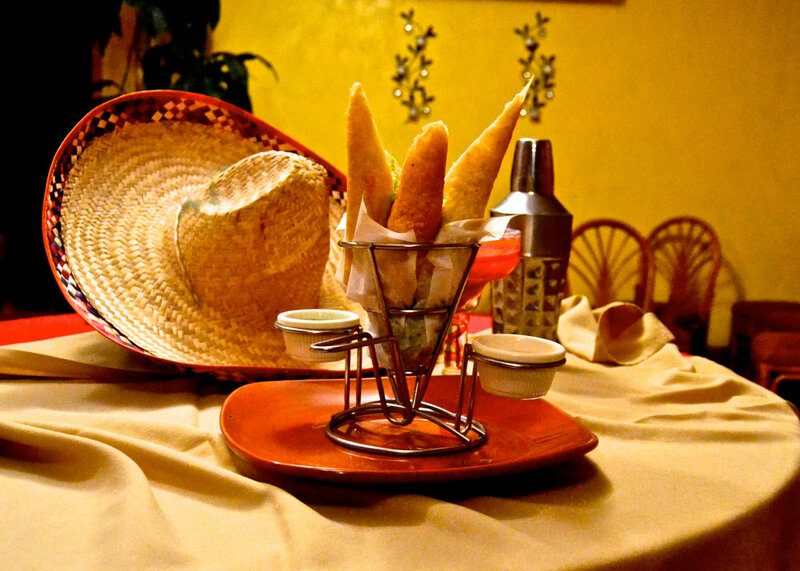 All of our dinners are served with your choice of refried, charro or black beans. Tortilla soup or salad with our casa dressing. Chunks of tender beef cooked in chile guajillo red sauce, served with corn or flour tortillas. Prepared in a traditional mexican manner, strips of marinated broiled steak, served on soft doubled corn tortillas, with sliced avocados, and pico de gallo. Two ground beef turnovers served with black beansand guacamole. Diced pork simmered in a chile ancho sauce served with corn or flour tortillas. Tender chunks of pork cooked in the old Mexican tradtion, served with corn or flour tortillas and pico de gallo. Strips of chicken breast sautéed in our spicy cream sauce served with corn or flour tortillas. Skirt steak marinated and topped with a spicy chile ancho sauce and 3 cheeses. Taco, enchilada, beef or chicken tamale, beef or chicken burrito or chile relleno. All fajitas include rice, choice of beans, and fresh guacamole, sour cream and warm tortillas. Grilled strips of seasoned chicken breast. Grilled strips of seasoned steak. Succulent jumbo shrimp seasoned and grilled. A combination of chicken, steak, and shrimp fajitas. All chimichangas are topped with guacamole and sour cream. A deep fried chicken burrito. A deep fried beef burrito. A deep fried burrito stuffed with strips of marinated steak and cheese. Two delicious enchiladas stuffed with spinach, smothered with salsa española and cheese. Two tortillas dipped in a tomatillo green sauce, stuffed with chunks of chicken rolled and topped with more sauce, melted cheese and sour cream garnish. Four crispy fried tortillas, rolled and stuffed with shredded beef, garnished with guacamole and sour cream. Two flour tortillas rolled, one with beef and cheese, one chicken and cheese, deep fried, garnished with guacamole and sour cream. Served with tortillas, rice, and your choice of beans. A crisp corn tortilla topped with refried beans and two fried eggs, smothered with salsa ranchera and cheese. Eggs scrambled with mexican sausage, chopped green vegetables and tomatoes. Shredded beef cooked with scrambled eggs, tomatoes, onions, and bell peppers. A large flour tortilla filled with shredded beef and your choice of beans. Topped with salsa española and cheese. served with sour cream. A large flour tortilla filled with chicken, cheese and your choice of beans. Topped with salsa espanola and served with sour cream. Carnitas, cheese and your choice of beans wrapped in a flour tortilla, topped with a verde sauce. served with pico de gallo. Strips of broiled marinated steak, cheese, and your choice of beans wrapped in a flour tortilla. Topped with salsa roja and avocado slices. A gigantic monster burrito stuffed with beef or chicken fajitas, guacamole, sour cream, pico de gallo, your choice of beans, and lettuce, covered with cheese and your choice of one of our delicious sauces. Jumbo shrimp dipped in coconut batter. Served with rice and black beans. Grilled chichen and shrimp, sautéed in our sarandeada sauce. Topped with melted cheese and avocados. Ensenada style fish tacos, two beer battered tilapia tacos with shredded cheese, pico de gallo and topped with a slice of avocado. Served with black beans and our delicious sarandeado sauce. Two soft corn tacos, filled with marinated and broiled salmon, pico de gallo and cheese. Served with rice and beans. Jumbo shrimp sautéed to perfection in our spicy cream sauce. served with cilantro rice and black beans. Grilled atlantic salmon filet sautéed in a chile guajillo sauce. Served with cilantro rice and black beans. Cod stuffed with shrimp and crab meat, topped with a spicy cream sauce. Served with rice and black beans.